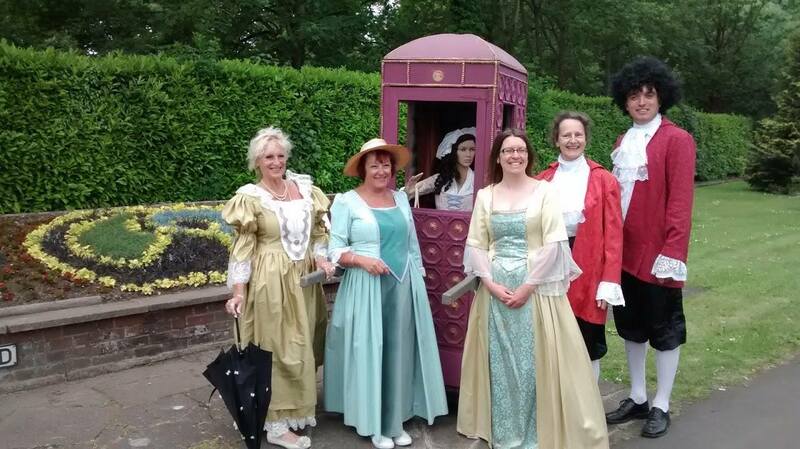 On 10 June, 2015 we paraded our (ok it’s a model) heroine Lydia Hardy through Chesham High Street in a sedan chair. Huge thanks to Chesham Bois Catholic Players for the loan of the magnificent costumes and to everyone who stopped to chat, waved or beeped their car horns at us! Chesham – Buckinghamshire’s first Fairtrade town! On 29th March 2005 became the first Fairtrade Town in Buckinghamshire. The first certificate was officially handed to ‘Chesham4Fairtrade’ by local MP Cheryl Gillan at The Elgiva Theatre. In 2015, the town’s Fairtrade status was renewed for the 10th consecutive year. Thank you to who have helped and supported along the way, and those who have bought Fairtrade locally! Lydia Hardy, nee Priest (1755-1794) Chesham’s early Fairtrade pioneer! Born in Chesham in April 1755, Lydia was the daughter of Chesham carpenter, Nathaniel Priest. In February 1771, when Lydia was 15, her father took out a short lease on a premises on Pillory Green (now The Broadway) which included a property with a woodshed and garden leading down to ‘the brook’. Given the description of this property, this is most likely near where Oxfam is today, and is so far the only known address for Lydia Priest’s time in Chesham. In 1781, Lydia married Thomas Hardy who was a Scottish shoe-maker living in London. They moved to Piccadilly in 1791 to develop his shoe-making business. Not long after, Thomas was one of those who founded the London Corresponding Society, a radical group which supported ‘universal suffrage’ – or at least giving votes to all men. Lydia also supported her husband in the anti-slavery campaign. The former slave and author, Olaudah Equiano stayed with them in London for a time. Lydia campaigned actively for the boycott of sugar from the West Indies – in a letter she wrote to her husband from Chesham in April 1792 while she was unwell, she asked about what was going on in Parliament over the slave trade. She also mentioned that other people in the town wereboycotting sugar from the West Indies. That same year, Chesham was one of many towns and cities which sent a petition to Parliament protesting against the slave trade (thanks to Alison Foster for this information). Thomas Hardy was later arrested, charged with treason and imprisoned in the Tower of London. He was held in a small room with a window over the Western Gate (where the gift shop now stands outside the Tower of London main entrance!). Lydia, heavily pregnant with their 6th child, often visited Thomas in prison. But on one occasion when she was at home, a mob gathered outside the Hardy’s home in Piccadilly. They were celebrating an English naval victory over the French and were targeting anyone they saw as sympathetic with the French Revolution. They started to attack the property, and with the help of some neighbours, Lydia managed to squeeze through a rear window to escape the mob. However, her unborn child died as a result. Shortly afterwards, on the 17th August 1794, while visiting Thomas in the Tower, she was seized with labour pains. The child was delivered still-born and Lydia died very soon afterwards. None of the Hardy children survived infancy. Thomas and his colleagues were cleared of treason and released to great public jubilation. His carriage was pulled through the streets by those who came to celebrate his release. They stopped for a moment of silence outside Hardy’s home. Soon after, Thomas went to visit his wife’s grave. Lydia had been buried in the grounds of St. Martin-in-the-Fields (her remains were probably among those disinterred to make way for a new road constructed beside the church, Duncannon Street). The memory of Lydia has been obscured by time and city development. But as an early campaigner for democracy and against the slave trade, she remains a Chesham heroine and one of Chesham’s first Fairtrade campaigners. So, Chesham’s Fairtrade status is perhaps over 200 years old! Chesham Museum, CBS, PRO, DNB, Tower of London and David Vincent, Testaments of Radicalism: Memories of Working Class Politicians, 1790-1885, and Claire Midgley, Women Against Slavery: The British Campaigns, 1780-1870 and JR Oldfield, Popular Politics and British Anti-Slavery.